Unholy beer – Belgian beer isn’t to everyone’s taste. 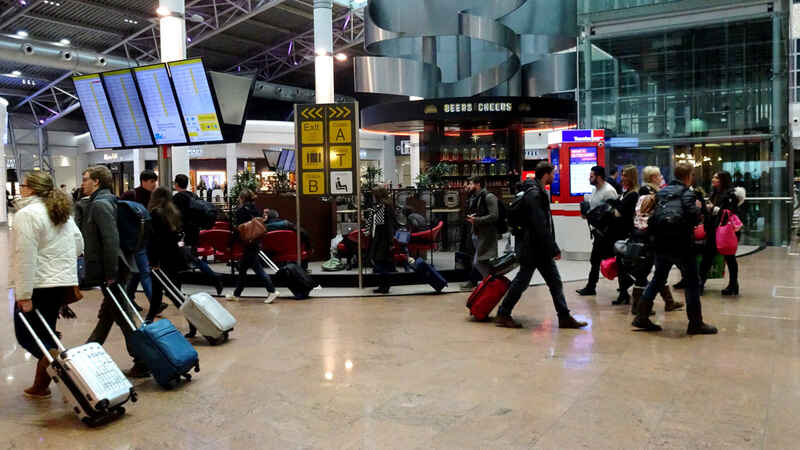 Snapshots of people seen and overheard recently at Brussels Airport. Living between Sweden and Belgium I’m getting used to passing through Brussels airport. Last time I wrote about it, after the bombings last spring, it was quiet and subdued. Now it’s back to its usual self. Busy with travellers. Business people in suits, blueteeth plugged into their ears, dragging rollerbags just the right size to carry-on. Family groups of adults, with kids high on excitement, swinging on tubular steel barriers or playing tag among the bags. Students with backpacks, surfpads or laptops, updating their social network status or hunting recharge sockets. Gaggles of teens and tweens (and thirty-somethings too) returning or departing on shopping sprees or sporting holidays. There’s always a little group (almost exclusively male) admiring the latest Toyota on display at Pier A in the main departures hall. Many different skin colours many different voices: French and Arabic, Dutch and German, English and Chinese. 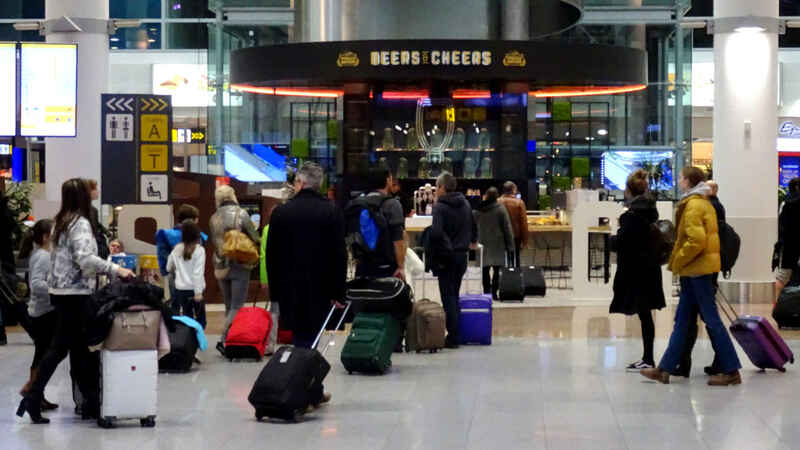 The shops and restaurants, cafés and bars are all well patronised as people search for gifts to take home, or while away the time waiting for their flights to be called. One of the bars is Beers and Cheers, filling the centre of an atrium surrounded by restaurants on the way to or from the A gates. I sit there now and then. I wouldn’t call it my regular spot – I don’t pass through BRU that often – but when I’m passing by, if I have the time, it’s my first choice. The last time I was there alone, the place was crowded. Nowhere obvious to sit. In the end I found myself a spare piece of a high table and occupied it with my tray before hunting down a bar stool to perch on. All done one-handed with my rucksack strap over one shoulder. Next to me on my right a couple of business types were communing in French over glasses of red wine. Beyond them a woman in a hijab was sitting with a glass of orange juice. She was gesticulating with both hands as she carried on a rapid conversation, apparently with herself. Then she turned her head and I saw the smarphone tucked tight into the cloth of her headscarf. Low-tech hands-free. To my left were two middle-aged men. They looked a bit rough, a bit worn. One was bearded and the other hadn’t shaved recently. They were blear-eyed and straggle-haired and wore scruffy trainers and jeans, t-shirts under flannel shirts. One had a puff jacket that had seen better days, nylon threads coming loose and standing away from his body with static. The other wore a parka, shrugged off his shoulders, military green with a fake fur trim. They had several open bottles of beer lined up between them on the table. Each also clutched or cradled a bottle in big hands, swigging from time to time. They were not talking. I ate my sandwich and sipped my own beer and gradually the noise around me subsideded. People set out for their gates or headed for the exit. The wine drinkers shook hands, cheek-kissed and went their separate ways. The woman in the hijab was swept off by a two other women similarly clad and swinging bags advertising Belgian chocolate and Victoria’s Secret. There was a long pause and I drank up my own beer. Hops are fruit, I thought. I might join the conversation with this observation. But how to say hops in Swedish? The word “humble” stumbled around my head. My gate would be up on the noticeboard by now. Besides, how would they react if they understood I’d been eavesdropping? I told myself to keep quiet. As I shouldered my rucksak I thought about buying them a couple of bottles of Kriek to try. Then I remembered the price of beer at the bar – ok, one bottle I thought. But they both looked and sounded like they’d really drunk quite enough already. Perhaps not. I rather thought they might turn out to be flying with me to Gothenburg, but they weren’t (or weren’t in a fit state). Either way, I didn’t see them again, but they stuck in my mind.